This Little Kids Payground Large Combo Design Bouncer is great for kids 9 and under. 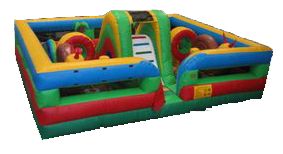 Inflatable Obstacles, Small Slide and Crawl throughs. It features an inflatable safety ramp at the entrance to protect excited kids as they scramble to get inside the bouncer. Appox 8-10 users at a time.